Well, the house got built and the Trace AC box / T-240 did in fact make it into the Power Panel, but I have the only Trace split apart back panel in existence! Trace decided not to offer the back panel as a separate piece. The AC box as it was called when mounted on the Power Panel also had room for the T-240. This box had room for two AC bypass switches as well as AC input breakers and the T-240 breakers. The T-240 was used only for single systems as it was for step up or step down only. One thing we did when converting the old T-220 into the new T-240 was to get rid of all those taps. I never did figure out how to wire theT-220, so the new T-240 got rid of all the wires that weren’t really necessary. I also never figured out why Trace would not sell the AC box without the autoformer? A few more years go by, a few more inverters are designed and then on July 31, 2000 the new owners of Trace, (Xantrex), decided to lay me off. As you can imagine, I was not pleased that Xantrex had laid off their chief mechanical engineer in Arlington, especially since I had paid for and owned about 1% of the company. The very next day while filing for unemployment I decided that there were still too many good ideas swimming around in my head, so I was just going to have to start my own company and compete with Xantrex. Enter OutBack Power Systems! The first ten months was spent in my home office designing sheet metal boxes to go with the FX inverter as well as the Trace DR, SW and Vanner RE series inverters. The OutBack inverter was still two years away from production, but the mechanical design was being worked on. By the time I rented a building in June 2001, the FX inverter mechanical design was virtually done. It would still be another 18 months before it worked well enough electrically to ship. The OutBack PSAC and PSDC were designed during that first six months of solitude in my home office. I had the chance to start with a clean slate and therefore was able to address some industry shortcomings that needed attention. The first thing to address was to allow ample room for wiring. 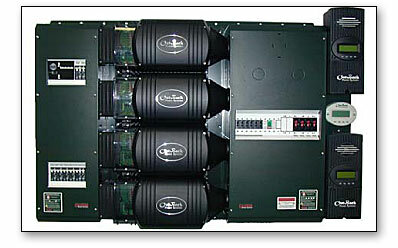 Compare the size of the AC and DC boxes between the OutBack Power Panel and the other popular breaker boxes. Big difference! There were a host of other improvements too. The Quad stack is the most versatile power center ever developed, but if you do not need all that capability, OutBack did not have a smaller solution. The OutBack enclosures se breakers that previously were not used in the AE industry. Square D breakers did not always fit the bill due to size, cost and DC voltage limitations, so new sizes and styles were in order. The decision to expand on breaker styles has been a good thing for our industry. We now have good small and inexpensive breakers rated for 125VDC. The AC equivalents are also small and economical. To address the size, weight and cost issue of the quad stack, I developed the OutBack PS2 system about a year later. 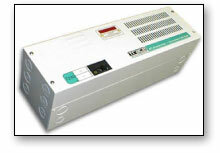 This has grown to be the industry standard for dual inverter systems. While the PS2 system enjoys great acceptance in North America, it is virtually non existent in Europe, Africa, Australia and New Zealand. There are a couple of reasons for this. It is physically too large for European homes. It uses breakers not available outside of North America, it is expensive and it looks too American.